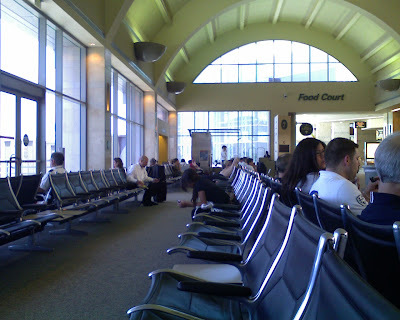 Here's some pics taken by Darth Toll at the Southwest terminal at the John Wayne airport in Orange County last Friday. Not as bad as Burbank, but not great either. Max, I just sent you a couple of pictures from the OC (John Wayne). 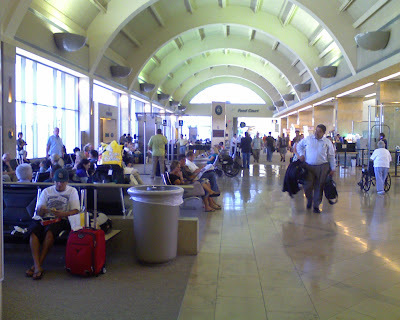 It's got a decent flow of traffic, but I've seen this terminal so packed you could barely get a seat and it's nowhere near that level right now. Plenty of open seats, even ones with power for laptops. If anybody else has photos of empty shopping centers, stores, airports etc. that are usually very busy, send them to me and I'll post them here. Since I play with aviation stats for a living, I will try and run some for the local CA airports. But I am on deadline and out of town right now. As for our neck of the Sacramento woods, there is so much empty retail and commercial...I think we are more than half empty. But they just keep building more. Someone must be getting an enormous tax write off, cause I can't figure out how the economics work any other way. Those didn't turn out too bad. Taken with a Palm Centro (Verizon). I should have gotten some Sacramento shots as the baggage claim area and much of the terminal area was definitely very low volume. All of the baggage carousels were actually turned off until our baggage started coming out. This was around 4:30 PM last Thursday.